Why do renewables grow faster in some countries than others? Germany is often identified as a leader in climate policy with its growth in renewables and ambitious energy transition program. Can Germany’s experience be replicated in other countries? Answering this requires an understanding of what facilitated Germany’s energy development: was it a political choice, economic factors, or technological developments? In 2016 the IIASA Energy program (ENE) explored these questions by comparing Germany’s energy history to Japan’s. Why do some countries actively adopt renewables, while others extend their nuclear programs or expand their use of fossil fuels? Simplistic explanations blame slow progress on “lack of political will” or “lobbying by special interests” and link success of renewables with “good policies” and a “strong environmental culture”. But empirical analysis of historic changes in energy systems can identify more tangible factors which influence how energy systems evolve. ENE researchers began by comparing Germany and Japan, two countries with similar energy paths in the 1970s and 1980s but very different energy mixes today: Germany is expanding renewables and phasing out nuclear power while Japan lags behind in renewables and relies on nuclear energy. The popular narrative of the ”Energiewende” is that Germans rejected nuclear power after Fukushima and expanded renewable energy because of public concern about climate change. In comparison to Germany, Japan is often portrayed as clinging to old ways and unwilling to develop renewables, even after Fukushima . ENE research shows that these stories are myths. The difference between Germany and Japan started not after Fukushima, but 20 years earlier when Japan’s electricity sector was growing rapidly and it desperately needed new electricity sources, a demand that was not met with scarce fossil fuel reserves. At the same time, Germany was one of the world’s biggest coal producers, its electricity consumption stagnated and its energy security improved. As a result, in the 1990s, Japan was forced to build nuclear power plants, but Germany could do without them, and adopted wind power technology from neighboring Denmark. This adoption happened almost by accident and initially did not significantly impact the country’s energy balance, but it did create a large lobby of owners and manufacturers of wind turbines. It was this lobby that, through the Green party and in coalition with pro-coal social democrats, supported Germany’s decision to phase out nuclear power in the early 2000s. No such coalition was possible in Japan, which does not have domestic coal, where wind power had not developed, and where the nuclear industry was expanding to satisfy growing demand. By the early 2000s, the nuclear industry in Germany was already on its last legs, while Japan’s was flourishing. Political: how actively states pursue their energy goals such as energy independence, what strategies they adopt to facilitate both the growth of new and the decline of old sectors and how successfully the state policies pursuing these goals are captured and distorted by special interests. Changes in annual electricity consumption, nuclear power (NPP) capacity and non-hydro renewables output by decade, 1970–2010. Cherp A, Vinichenko V, Jewell J, Suzuki M, & Antal M (2016). 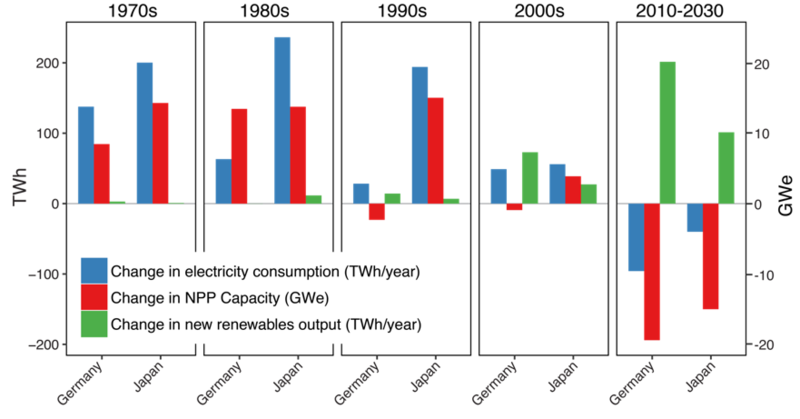 Comparing electricity transitions: A historical analysis of nuclear, wind and solar power in Germany and Japan. Energy Policy 101: 612-628. Cherp A & Jewell J (2016). Energy policy: Renewables targeted before Fukushima. Nature 533 (7601): 036.